As someone who has built an entire web design business using Weebly, these are three of the questions I’m most often asked. And since I’ve already thoroughly answered the third question with my full Weebly review, I’m going to focus this post on the first two. In short, doing SEO for Weebly is just like doing SEO for any other website. It’s just simpler. The first step of any SEO project is diligent keyword research, and that’s no different when it comes to Weebly SEO. Knowing what your target audience is searching for is the only way to provide the answers they seek. Some believe that Google’s free keyword planner is sufficient for keyword research. I strongly disagree. Google has no real incentive to provide a good keyword research tool to you. Their ad business is their bread and butter. Google would rather have you pay them to promote your site on the first page of search results. Paid keyword research tools, on the other hand, have everything to lose by not providing a quality product. Their success relies on your success. There are a lot of keyword research tools to choose from these days. I use SECockpit so, for the purposes of this tutorial, I’ll be showing you how I use it in my Weebly SEO process. Since most keyword tools follow a similar process, you should have no problem repeating the process with your own. Let’s say you own a business called Highpeak. Your product? Custom snowboards. Your job now is to determine what people who are into custom snowboards are searching for in Google. The keyword “custom snowboards” gets a decent amount of searches, but is also more competitive. A “Niche” bar that automatically tells you if there is an opportunity to be found with that keyword. The fuller the green bar, the better the opportunity. Now we know that going after “custom snowboards” may prove to be a bit difficult for a site that hasn’t established itself yet. Domain Authority: A number ranging from 1-100 that tells you how much authority, or power, a website has. The higher the number, the stronger the website. Page Authority: Same as Domain Authority, but focusing on a specific page of a website. When checking how competitive a keyword is, you generally want to look for keywords that have websites with a DA of less than 40, ranking in the top 10 of search results. This screen tells us that there is room to compete here. Three of the sites in the Top 10 have DAs of less than 40, and ALL of the pages have PAs of less than 40. We now know that it makes more sense to target “womens snowboards” and “snowboards for sale“. They’re still very much related to custom snowboards, but it will be much easier to rank highly for those keywords, thereby boosting traffic to our site. So, let’s try to target our keywords even further, and run a search for “womens snowboards“. By narrowing down our niche even further, we were able to find even more juicy, low competition keywords. Time to head to Weebly! On-page SEO is the bulk of the work. It involves any work and optimization made to your website itself. There’s a lot that goes into it and, thanks to Google’s constantly changing algorithms, it’s constantly evolving. Use a descriptive site title, incorporating your target keywords and phrases. If you’re selling stuff online, turn on SSL. It costs extra, but it’s necessary. Google punishes sites that accept credit cards without using SSL security. Site description should be filled with your targeted keywords, but still natural language. Don’t just stuff keywords in there if it doesn’t make sense! Meta keywords is simply for entering as many keywords as possible, sorted by commas, and sorted by priority. It’s not as important as it used to be, but still good to do. Put your Google Analytics tracking code in the footer code box! You definitely need to be using Google Analytics to track your SEO strategy’s success. Page title should be a one sentence description of what the page is about. You can customize the page permalink. This is new to Weebly 4! Change the url to include a more SEO friendly name. Page description is very similar to the site description in general settings. 250 characters to tell the world what that page is about. Again, don’t forget your keywords! Meta keywords is simply for keyword stuffing, like the general SEO settings. Name the image after one of your keywords or phrases. Reduce the size of the image in Photoshop. The faster your site loads, the better, and images take up a lot of space. If you want great results to your SEO work, you need to be blogging. Period. Write articles with topics that can incorporate useful keywords. For example, remember the second and third keywords we’re targeting? “womens snowboards” and “best snowboards 2017“. You could write a listicle titled “The 9 Best Women’s Snowboards of 2017″ that would answer both of those searches. Make good use of your category names. Try to use keywords, but do it naturally. Your Author box should be a few eye-catching sentences that is fun to read. Don’t be afraid to use a little humor and personality. Insert links to your other articles in your posts. Internally linking within your blog is good for SEO. Link to high Domain Authority sites that provide sources for claims that you make in your posts. You’ve probably noticed that most websites have a “second navigation menu” at the bottom. This is called the footer. By setting up your footer to have links to all of the sections of your site , you effectively give Google a map of your site. This helps Google to know how your site is laid out, and makes it easier for their bots to crawl it. List and link to all of the individual pages of your site. The text used in a link is called the “anchor text”. Try to use keywords instead of generic names. For example, a marble restoration company could call their blog “Marble Care Tips” instead of merely “Blog”. Display your business’ address and contact info. This is by far the most often overlooked aspect of SEO. Over the years, Google has placed a greater emphasis on user experience. Making sure searchers find the answers they need when they click on a search result is Google’s #1 priority. Because, really, if you weren’t getting the information you need, why would you bother using Google next time you have a question? Make sure your site loads fast. You can use tools like Google’s Pagespeed Insights to determine if it’s fast enough. Less is more. Your website needs to be clean, simple, attractive, and easy to navigate. If it doesn’t add clear value, don’t bother adding it to your site. Have a clear CTA. Your Call To Action should be crystal clear. Drive your visitors to take action on one thing. Your website MUST use responsive design. This mean that the website will look great on any device. If it isn’t responsive, Google will punish you. You can use Google’s Mobile Friendly Test to determine if your site is… mobile friendly. Off-page SEO is mainly centered around one thing: Backlinks. As we discussed earlier, getting backlinks to your site from high Domain Authority websites gives you street cred. It tells Google that you’re worth paying attention to. There are many strategies to getting good quality backlinks, including using tools like Help a Reporter Out to get quoted by major blogs and news outlets. Blogging plays a key role in this. When you write great content worth reading, and promote it the right way, you start to get noticed. It’s how I managed to get mentioned in major websites like Entrepreneur, Buffer, FitSmallBusiness, SixRevisions, and more. Get more high quality links, boost your Google rankings. It’s that simple. Set up business listings with Google, Bing, Yelp, and Facebook. I know, it’s hard. And annoying. But building a successful business hinges on building meaningful relationships with people, whether online or offline. In the early stages of your new business, the majority of your customers are going to come from referrals. Team up, collaborate, volunteer, whatever it takes… Just get out there and meet some peeps. Hopefully I’ve done enough to convince you that ranking your Weebly website on the first page of Google is not impossible. Weebly is a fantastic web design platform that helps make SEO as simple as possible. That said, regardless of what type of web design platform you use, SEO is a lot of work. It takes patience and determination to get your site to rank #1. But as the old saying goes, “nothing worth having comes easy”, right? Need some help with your Weebly SEO strategy? Give me a shout! Is Weebly good for SEO? Yes. Weebly works just fine with SEO. While there are multiple ranking factors, Weebly websites have just as much opportunity to rank #1 in Google as any other website builder. It all depends on how you build your Weebly website. What are the SEO settings in Weebly? 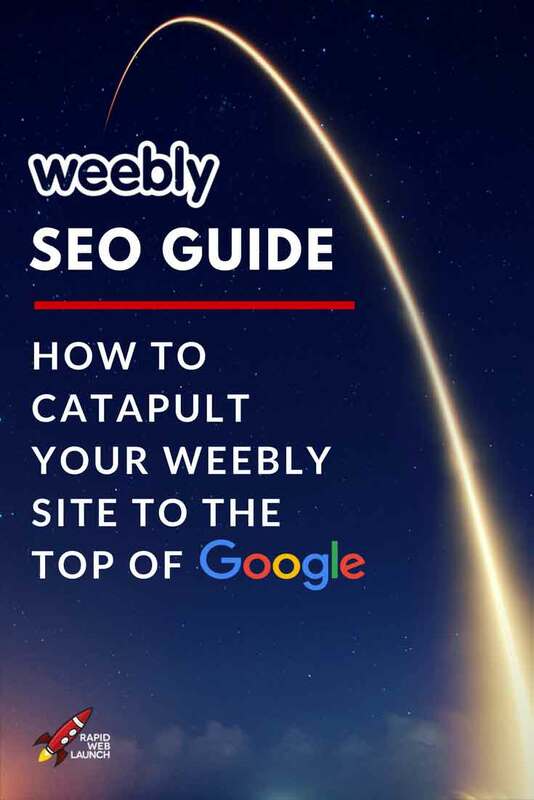 Weebly’s SEO settings help you optimize your Weebly website to rank better in Google. Make sure you use them! How do I add SEO keywords to my Weebly website? Keywords are just words. You have to do keyword research with an online tool to determine what keywords you want to use in your site, then simply find ways to incorporate those keywords into the headings, paragraphs, meta descriptions and image alt tags. Hi Patrick thanks for the article. Should I leave the show site title on pages box checked under settings or will this hurt seo rankings since each page will have have a title. Also should I fill out individual page settings for my homepage? Weeebly has been unclear about this, some of their seo guidelines say to uncheck the box under to display site title on pages and leave the homepage seo settings blank. Thanks in advance. Nice article. some useful tips that i have not yet implemented. in response to the comment June 2nd, can a weebly site still be on page 1 of Google, i am using a dot weebly dot domain. Ive had the site years. but only last year submitted it to Google and more recently, Bing. I have numerous pages that end up on page 1 of Google, even ranked 1st. Am thinking of upgrading. you mentioned that with a dot weebly dot com, my content belongs to Weebly. but if I upgrade it becomes ‘mine’.? i switched to https recently and traffic increased. i am thinking to upgrade to increase traffic further. No. Free websites cannot. The reason being your content does not belong to you. It belongs to Weebly.com. Invest the $8/month into getting your own domain. It’s about 2-3 cups of coffee a month. ? I am actually planning to use weebly, but I have doubts about it. But this article is a great help to make up my mind about using weebly. Thanks for sharing this piece of information. Such a great help! Glad I could help Nico! How much does a blog on Weebly costs? Weebly has several pricing options. They have a free option, but you don’t get your own custom domain, and Weebly displays a banner across your site. Their cheapest paid option is $7.99/month. What kind of freedom do you require for your hosting? You have to host your website with Weebly. They don’t give you an option. You CAN register your domain somewhere else, and just point Weebly’s hosting to it. Is that what you’re referring to?